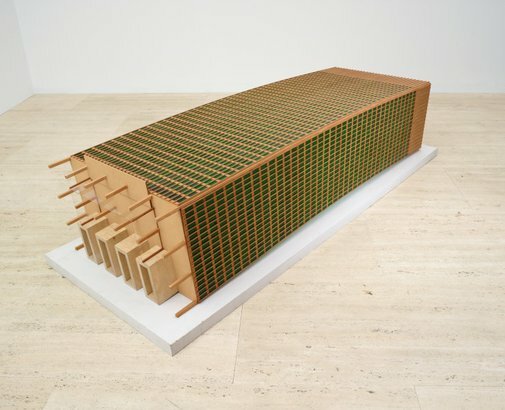 While Angus’s art is not minimal, it shares minimalism’s interest in primary structures and physical presence, and suggests that their source may be found in much earlier developments in modernist architecture and design such as the use of serial repeated forms, manufactured units, structuring grids and highly finished surfaces. The physical and perceptual disorientation of the sculptures, achieved through a mathematically correct displacement of rational geometry, bends our experience of these familiar iconic buildings. 'The Seagram building' was designed by Mies van der Rohe and completed in 1958, becoming an instant modernist icon with its shimmering glass walls, grid structure, base raised on columns and lift shafts and extensive plaza at street level. The dramatic impact of this building is due to the emphasis on the visual qualities of the structure which is as important as their functionalism. Angus’ obsessively handmade version lies on its back, bucking up from the floor. While it is physically correct within the geometric logic that Angus has subjected it to, it almost has an organic quality as well, like a plank that has been left out too long in the rain. Angus proposes alternate perceptual models that are inherent in geometry’s rigorous spatial logic and mathematical precision, creating wormholes in the laws of physics and optics that quite literally alter, at least in sculptural form, how we view the world.